2XU = “Two Times You.” What is it? An Australian company known for its comfy compression gear, which athletes believe helps them recover more efficiently. “Apparel engineers” from 2XU are even working with the Australian Institute of Sport to get some really good science behind the whole compression wear phenomenon–also known as “crack clothing,” says a 2XU spokesperson, for its ability to get athletes of all levels hooked on the garments. Nuun = “Noon.” Like the time of day. Drop one of these little tablets into water and you get a nice, subtle flavor plus key electrolytes that you just sweated out–all for just 8 calories. They dissolve super quickly, and they’re perfect when you’ve had all the nutrition you need but your hydration needs that extra electrolyte boost. Newbie = Oh, nevermind. You’re not gonna need that. 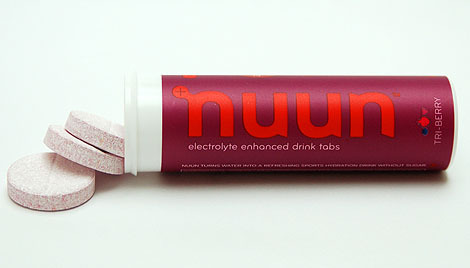 Nuun tropical flavor tabs get a thumbs up from me!